Because even though you’re not in your prime anymore, you still deserve to enjoy life to the fullest, and your sexual experiences are an important part of this process. Because passion isn’t necessarily dead after dozens of years of married life, and you can enjoy each other better if both of you are confident in your performance! · 60 capsules per container. ADD TO CART NOW and get your confidence back with this cost-effective and efficient solution! 2 tablets daily with meals or as directed by a healthcare professional. SATISFACTION GUARANTEED: These dietary supplements are US formulated, Non-GMO and GMP certified, with high quality ingredients. If you are not 100% satisfied with the result, we will return your money back, no questions asked. 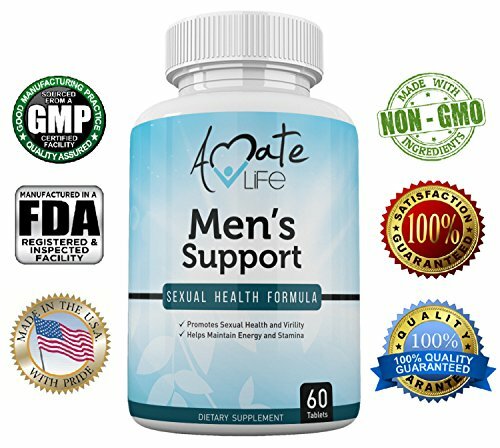 SEXUAL HEALTH- Amate Life Men’s Support Has been strategically design help your body get specific nutrients to fight back the natural aging of your sexual system. Specific Herbs with great stimulant qualities have been selected to help boost your testosterone levels, libido and overall sexual health. This Product in combination with healthy lifestyle will help you feel young again. SUPPORTS TESTOSTERONE LEVELS: After the ages of 30 – 40 a man’s testosterone levels fall by about 1% every year. This specially designed formula for sexual support contains all-natural ingredients such as Tribulus Terrestris and Arginine that has been used for centuries in herbal medicine to help stimulate your testosterone levels in a natural way. The powerful herbal extracts contained in these capsules help support testosterone production and healthy hormonal levels. ENERGY ENHANCEMENT: This vegetarian plant-based complex acts as an energy booster for your basic metabolic functions. The active ingredients contain essential nutrients which help in common problems such as mental and physical fatigue, high blood pressure or heart disease. PREMIUM QUALITY: These Sexual Enhancement Dietary Pills are an ideal choice for men with special nutritional regimes, as they are 100% vegetable. The qualitative superiority of their ingredients is demonstrated by their GMP seals, non-GMO and US formulated recipe.